PASARICA, A. , ANDRUSEAC, G. G. , ADOCHIEI, I. , ROTARIU, C. , COSTIN, H.
Eye-tracking devices are currently used for improving communication and psychosocial status among patients with neuro-motor disabilities. This paper presents the experimental implementation of a control system for a robotic platform using eye tracking technology. The main system is based on an eye tracking subsystem that uses the circular Hough transform algorithm. A central processing unit performs the data transmission between the user and the robotic platform. Experimental tests were conducted to determine the device's performances and usability for patients with neuro-motor disabilities. Moreover, the test results were used to determine the control system learning curve. We created a data base containing information on the robotic platform processing time and precision of movement for improving the platform's performances. S. Fasoli S., I.H. Krebs, N. Hogan, "Robotic Technology and Stroke Rehabilitaion: Translating Research into Practice", Topics in Stroke Rehabilitaion, vol. 11, iss. 4, pp. 11-19, 2004. L. Demers, R. Weiss-Lambrou, B. Ska, "The Quebec User Evaluation of Satisafaction with Assistive Technology (QUEST 2.0): An Overview and Recent Progress", Technology and Disability, vol. 14, pp. 101-105, 2002. S. Verma, P. Pillai, Y.F. Hu, "An eye tracking based wireless control system", in Proc. 26th International Conference on CAD/CAM, Robotics and Factories of the Future, Kuala Lumpur, Malaysia, pp. 686-696, 2011. N. Cherabit, F. Z. Chelali, A. Djeradi, "Circular Hough Transform for Iris localization", Science and Technology, e-ISSN: 2163-2677, 2(5), pp. 114-121, 2012. G. Andruseac, R. Iacob, "Exploring the potential of using educational robotics as an effective tool to support collaborative learning", in Proc. 4th IEEE International Conference on E-health and Bioengineering EHB 2013, ISBN: 978-1-4799-2372-4, pp. 1-4, 2013. R.G. Lupu, R.G. Bozomitu, V. Cehan, "Detection of Gaze Direction by Using Improved Eye-Tracking Technique", Proceedings of the 37th International Spring Seminar on Electronic Technology (ISSE), Dresden, Germany, pp. 298-301, 2014. R.G. 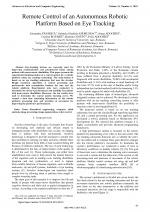 Bozomitu, "New Method of Detecting Voluntary Blinking Used to Communicate with Disabled People", Advances in Electrical and Computer Engineering, ISSN: 1582-7445, vol. 12, No. 4, pp. 47-52, 2012. E. Pasqualotto, T. Matuz, S. Federici, C.A. Ruf, M. Bartl, M.O. Belardinelli, N. Birbaumer, S. Halder, "Usability and Workload of Access Technology for People with Severe Motor Impairment: A Comparison of Brain-Computer Interfacing and Eye Tracking", Neurorehabilitation and neural repair, 2015. J. L. Collinger, M. L. Boninger, T. M. Bruns, K. Curley, W. Wang, D. J. Weber, "Functional Priorities, Assistive Technology, and Brain-Computer Interfaces after Spinal Cord Injury", Journal of Rehabilitation Research and Development, vol. 50, no. 2, pp. 145-160, 2013. S. Saha, S. Neogy, "A Case Study on Smart Surveillance Application System Using WSN and IP Webcam", Applications and Innovations in Mobile Computing (AIMoC), Kolkata, pp. 36-41, 2014. C. C. de Wit, B. Siciliano, G. Bastin, "Theory of Robot Control", Springer Science and Business Media", ISBN: 978-1-4471-1503-8, 2012. H. Qin, X. Wang, M. Liang, W. Yan, "A Novel Pupil Detection Algorithm for Infrared Eye Image", Signal Processing, Communication and Computing (ICSPCC), KunMing, pp. 1-5, 2013. D. Li, D. Winfield, D.J. Parkhurst, "Starburst: A hybrid algorithm for video-based eye tracking combining feature-based and model-based approaches", Human Computer Interaction Program, Iowa State University, Ames, Iowa, 50010.University Science, 1989. R.J. Jacob, K.S. Karn, "Eye Tracking in Human-Computer Interaction and Usability Research: Ready to Deliver the Promises", The Minds Eye: Cognitive and Applied Aspects of Eye Movement Research, Section 4, Hyona, Radach & Deubel, Oxford, England, Elsevier Science, ISBN:0-444-51020-6, pp. 573-605, 2003. M. Soltany, S.T. Zadeh, H.R. Pourreza, "Fast and Accurate Pupil Positioning Algorithm using Circular Hough Transform and Gray Projection", International Conference on Computer Communication and Management, Singapore, vol. 5, pp. 556-561, 2012. R. G. Bozomitu, A. Pasarica, V. Cehan, C. Rotariu and C. Barabasa, "Pupil centre coordinates detection using the circular Hough transform technique," in Proc. 38th International Spring Seminar on Electronics Technology (ISSE), Eger, 2015, pp. 462-465. D. M. Stampe, "Heuristic filtering and reliable calibration methods for video-based pupil-tracking systems", Behavior Research Methods, Instruments, & Computers, vol. 25, iss. 2, pp. 137-142, 1993. D. Novischi, C. Ilas, S. Paturca, M. Ilas, "Vision Based Autonomous Navigation in Unstructured Static Enviroment fo Mobile Ground Robots", Control Engineering and Applied Informatics, ISSN: 1454-8658, vol. 13, no. 2, pp. 26-31, 2011. C. Ilas, D. Novischi, S. Paturca, M. Ilas, "Real-Time Image Processing Algorithms for Object and Distances Identification in Mobile Robot Trajectory Planning", Control Engineering and Applied Informatics, ISSN: 1454-8658, vol. 13, no. 2, pp. 26-31, 2011. L. Valk, "Lego Mindstorms EV3 Discovery Book: A Beginners Guide to Building and Programming Robots", No Starch Press, ISBN: 978-1-59327-532-7, 2014. K. Holmqvist, M. Nystrom, F. Mulvey, "Eye Tracker Data Quality: What It Is and How to Measure It", Proceedings of the Symposium on eye Tracking Research and Applications (ETRA), New York, pp. 45-52, 2012. A. Tuncer, M. Yildirim, K. Erkan, "A Motion Planning System for Mobile Robots", Advances in Electrical and Computer Engineering, vol. 12, no. 1, pp. 57-62, 2012. 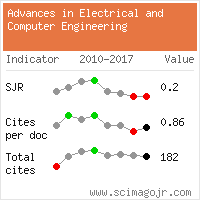 Citations for references updated on 2019-04-22 04:49 in 137 seconds.